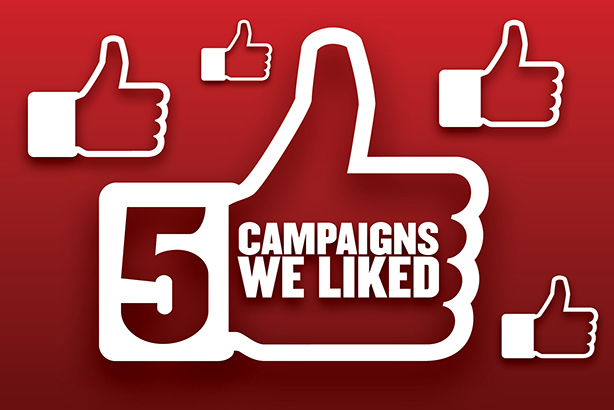 The hotly contested showdown between PRWeek's five favourite campaigns in March was won by KFC's Clean Eating Burger, receiving well over half (596) of the 969 votes cast. KFC UK & Ireland's cheeky take on the clean-eating craze, starring fictional food blogger Figgy Poppleton-Rice, was created by creative agency BBH London with the help of the in-house team and recently reappointed PR shop Freuds and promoted its new burger, The Dirty Louisiana. 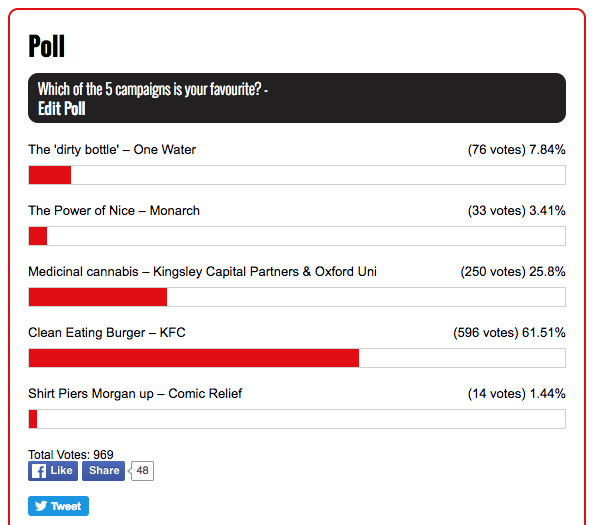 In second place, with 250 votes, was Kingsley Capital Partners & University of Oxford's campaign to fund research into medicinal cannabis, devised by Acuitas Communications; and in third, One Water's 'dirty bottle' campaign to raise awareness on World Water Day, created by Houston PR. KFC UK & Ireland had a cheeky take on food bloggers and the ‘clean eating’ craze to promote its new, very much non-clean-eating limited edition burger The Dirty Louisiana. It starred fictional foodie blogger Figgy Poppleton-Rice, who proffered clean eating advice on her own blog, along with her Instagram and Twitter pages. A video (above) showing Poppleton-Rice how to make the KFC Clean Eating Burger – made from a chia-seeded cauliflower bun, unsweetened almond yogurt, ice cube relish, spiralized chicken breast, and 100 per cent British kale - ended with a sign crashing down on her and a Southern voiceover stating: "Nothing satisfies like the Dirty Louisiana. It’s finger-licking good." Within a few days it garnered 4.8 million views, nearly 16,000 shares, and 53,000 comments, with pickup in publications including Business Insider, Men’s Health, Mashable, and Yahoo! News. The tongue-in-cheek campaign, created in-house with assistance from Freuds and BBH London, was perfectly produced and tapped into the zeitgeist with suitable humour to reach its target audience. The use of multiple channels also proved effective to spread the word - 'she' now has 20,000 followers on Instagram (above).